People believe in the story that, there is a vast difference between the reel world and real world. What we see in the movies does not happen in real world. In the movie, a successful businessman feeds the entire village but in the real world, there is no much space for such emotion. But this story will change that approach completely. In this story a successful restaurant owner who provides the FREE food to the hungry people. This is the story of Bangalore-based famous Lebanese Restaurant called BYBLOS which is well known for the delicious Lebanese food now serves the hungry people in Bangalore by providing them hygienic food and water for FREE. Based on the information made available on the social media in a form of video which displays the liberality of the restaurant owner. The restaurant has come up with the new unique idea to feed the hungry people (not necessarily beggars) in the town with the quality and delicious food. They have installed the “FRIDGE OF KINDNESS” outside their restaurant which is always kept stuffed with the food and water bottles. They keep the food in the fridge which is meant to feed the underprivileged and hungry people. It is the way of giving charity to those in need. 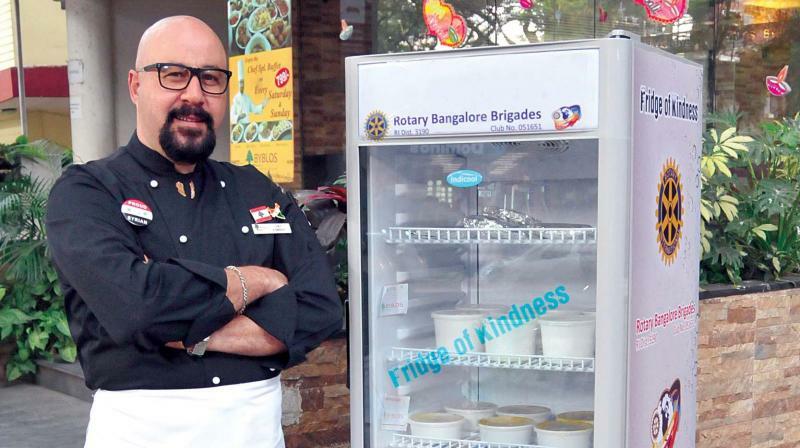 If anyone is passing through this restaurant they might come across a refrigerator outside the Byblos Lebanese restaurant in Indiranagar, Banglore and pick up the required food and water, says the Head Chef of Byblos, Mr. Ammar Al Molki. According to Mr. Molki, every day there are about 20 people who come over to eat the food. “I request every restaurants and hotel to follow us and help others in need by sharing food and to help each other as human beings. It makes me feel good that I can help underprivileged people in this way”. Byblos Restaurant started this initiative before Diwali and hopes to keep it going as long as it can.